For the past year my oldest child had asked over and over again when she could go to New York City, and over and over again we’ve answered, “We’ll get there at some point.” Of course the mythical “some point” just seemed to get pushed further into the future each time she asked, and finally we figured it was either now or never. So we put the wheels in motion, figured out a day when we could go, got the logistics in order, and today was that “some point.” It was incredible. 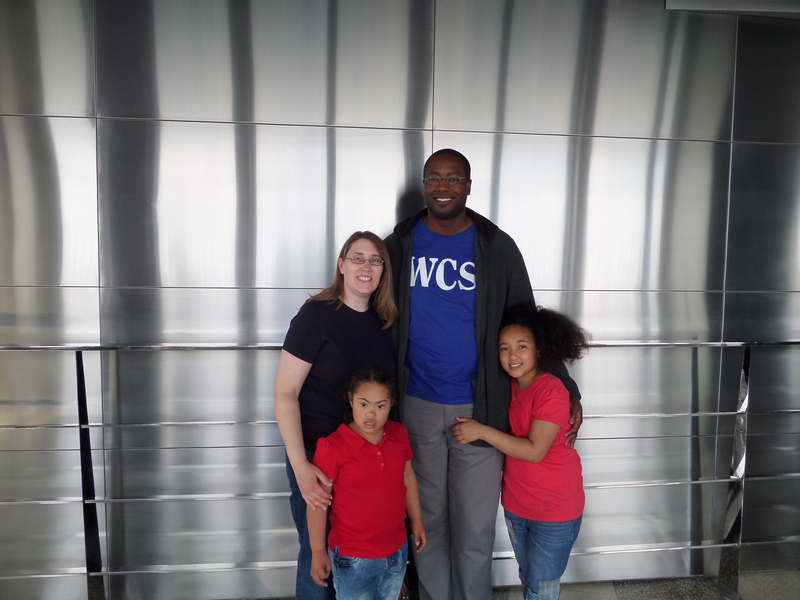 Now, I’ve been to New York City many times before, but each time is something special, and the last time was nearly 10 years ago, so this time was even more incredible, especially since I was finally seeing it through the eyes of my children. Track 1. 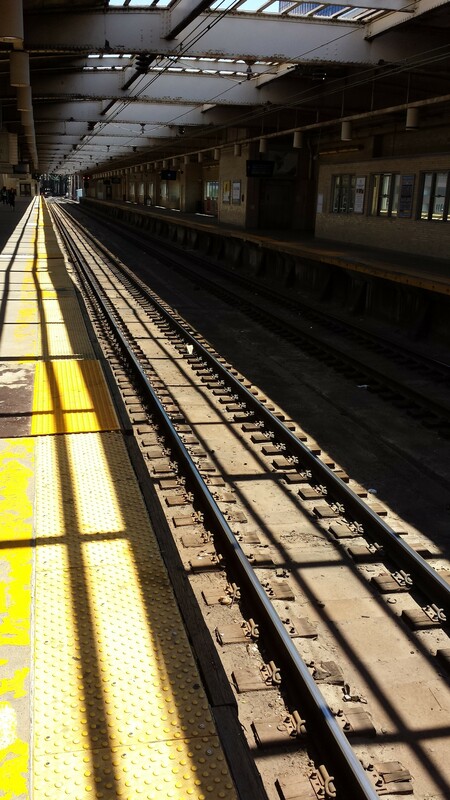 We came in on the NJ Transit Train, and it was difficult to figure out which train we needed. In the end we chose the right one. Now, if you’ve ever driven in NYC then you know no one wants to drive in NYC, and we were no exception. We would have spent half of our time either driving the streets aimlessly looking for a parking spot (and getting honked at), or parking in a ridiculously expensive parking garage and still having to brave the traffic in and out. So my wife came up with #3, which required renting a vehicle here in Philadelphia, driving it to Newark, and taking the Transit Train into the city, then doing the reverse to get back to the city of brotherly love. Not only was this option by far the cheapest, but it kept us out of the traffic of the city and kept us flexible if we had to stop along the way for restroom usage and the like. Then there we were, in New York City, in that Empire State of Mind. Now, we live in New York State, but The City is a whole other animal indeed. It’s like living in Florida but never going to Disney, and when you finally get there it’s better than you’ve ever dreamed. 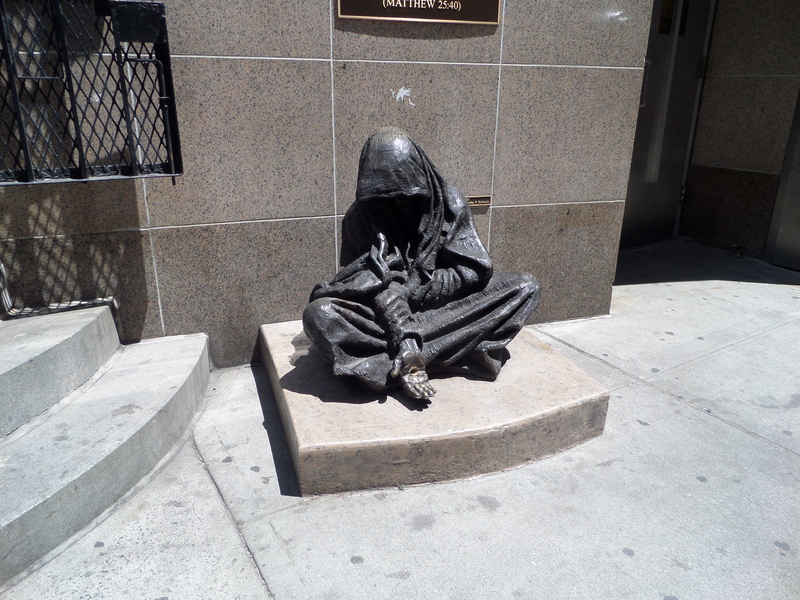 This is a statue we saw on 32nd Street as we headed into the city proper, and it spoke to me in some odd way. 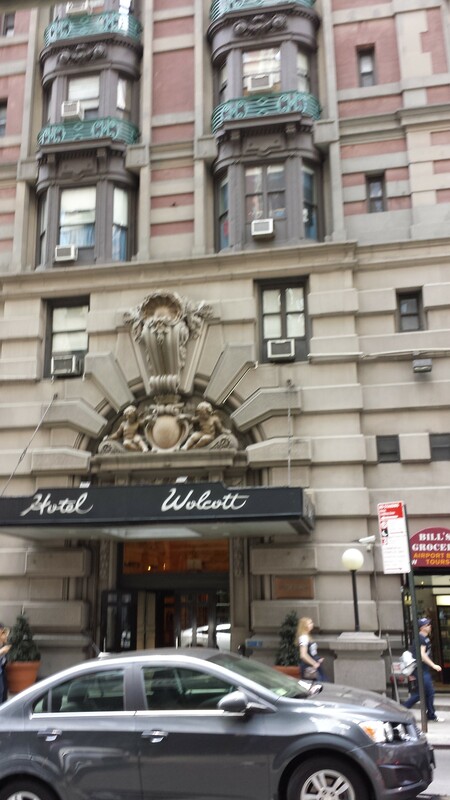 The Hotel Wolcott had green railings on its balconies that gave it a nice rustic look without seeming out date. I could imagine living there. 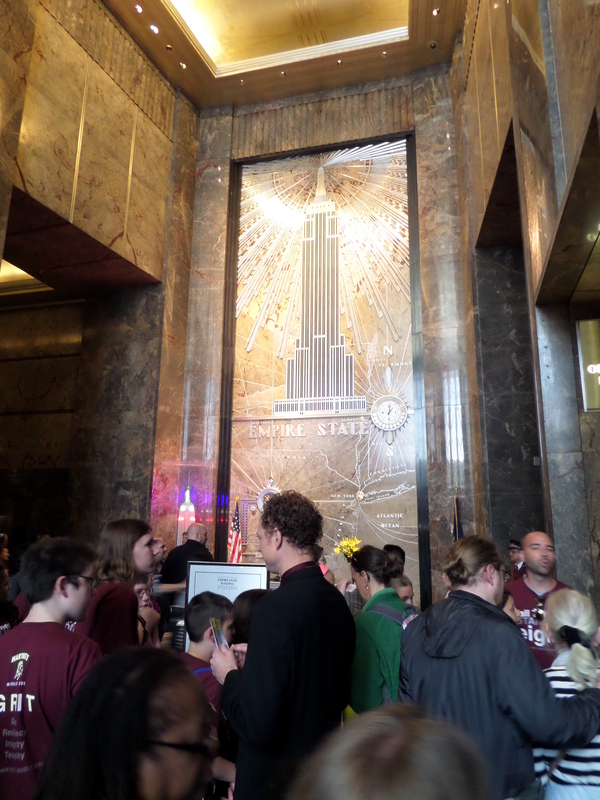 Our destination was the Empire State Building because Alexa would make a darn good engineer. A while ago what first sparked her interest in world buildings was a book given to her by my wife’s boss that pictured and detailed several prominent architecturally famous world structures, among them the Sydney Opera House, the Eiffel Tower, and of course the Empire State Building. She was fascinated by every single one, and memorized their details, so desperate she was to keep them in her mind. Because we live in New York State it seemed only natural that we would make it our first stop on the world tour, but because we live far upstate it wasn’t practical to try and make a day trip out of the ride that is a little over 4 hours from where we live. It made a lot more sense to come visit my mother in Philadelphia, and have her come with us. And that’s just what we did, turning it into a wider family trip that included not only my mother but also my nephew, who is home from college for the summer. So we left New York to go to New York. Go figure. 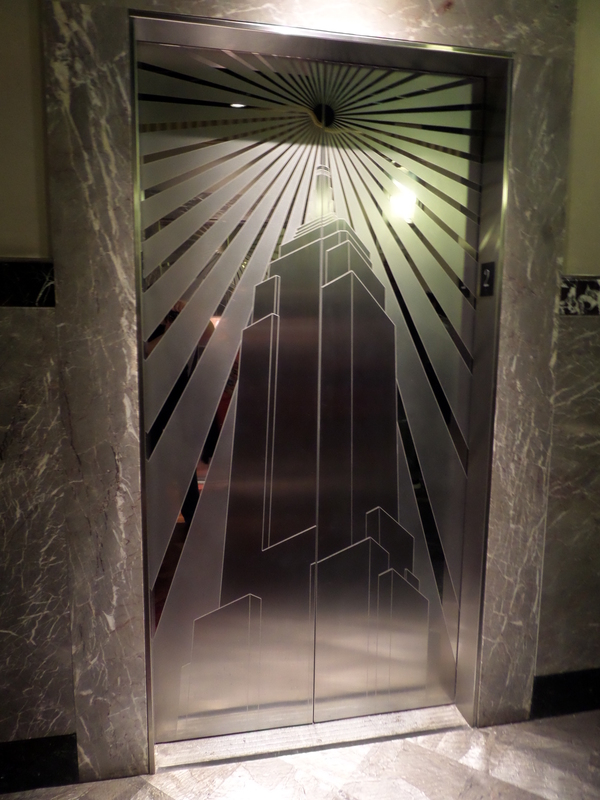 One of the famous 10 elevators at the Empire State Building. Such an iconic lobby, with an authentic desk attendant and everything (he’s hidden here). Then, after about an hour and 20 minutes of waiting we were finally herded into one of the illustrious elevators like sheep, slammed up against other tourists from all over the world, and whisked up to the 86th floor, and to the observation deck that also awaited. Alexa was just worn out by then, but when she saw the open-air deck she was in her element, floating on cloud 9. We went out and the wind was brisk high up there. Luckily for us it wasn’t raining at that point, so we were able to look far out, and far down (which freaked my wife out), and there were a series of “Oohs” and “Ahhs” that seemed to go on forever as she pointed out one building after another. “That’s the Chrysler building, isn’t it?” she asked me at one point, and I was again amazed at how much she files away in that brain of hers. 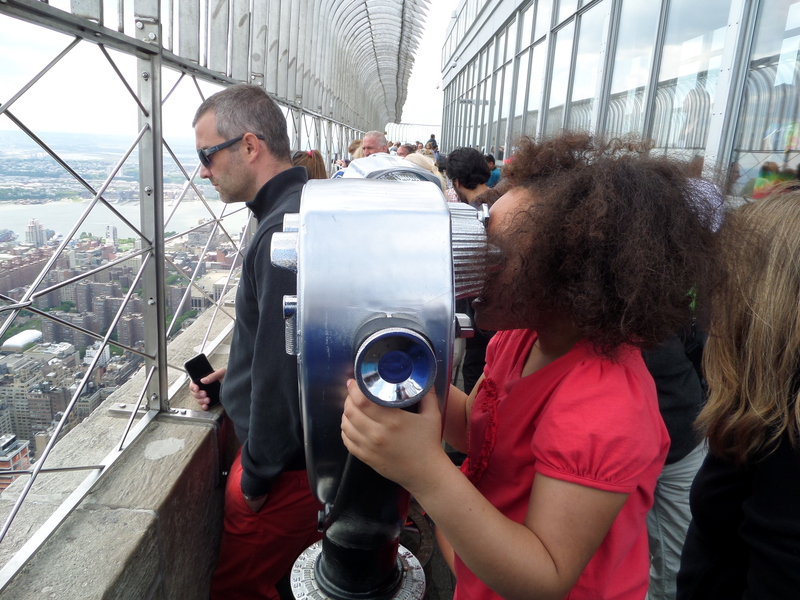 86th Floor Observation Deck, looking through metal eyes. The View to the Top. Empire State indeed. And around we went. Alexa just couldn’t get enough of all of the myriad views afforded to us from up so high. The heights didn’t affect her one whit, although my wife had to retire inside after just a few minutes with Madeline. I was on duty, though, pointing out each building and trying to help her see the islands far out to sea. We took a ton of pictures, not many of which actually came out great, but what I noticed most were the sheer numbers of people up on the observation deck, not the buildings down below. They were speaking a plethora of different languages, some of which were familiar to my ear and some of which weren’t. I guess I realized for the first time how big these famous landmarks truly are. I should have gotten it while in the long lines waiting to get up there, but somehow what was transpiring on the deck was more symbolic. But we were one big organism up there, moving around each other like dancing amoebas in a petri dish, pausing for photographs, then moving seamlessly past while nodding acknowledgement at each other. It was a special bonding moment, even though we said few words to each other. I took a lot more pictures down below to commemorate the moment. 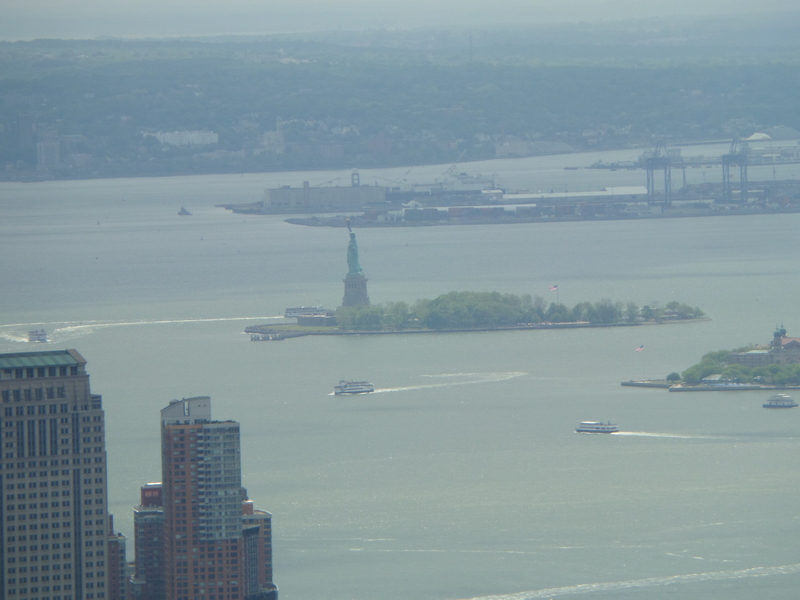 Lady Liberty presiding over the ships that pass. 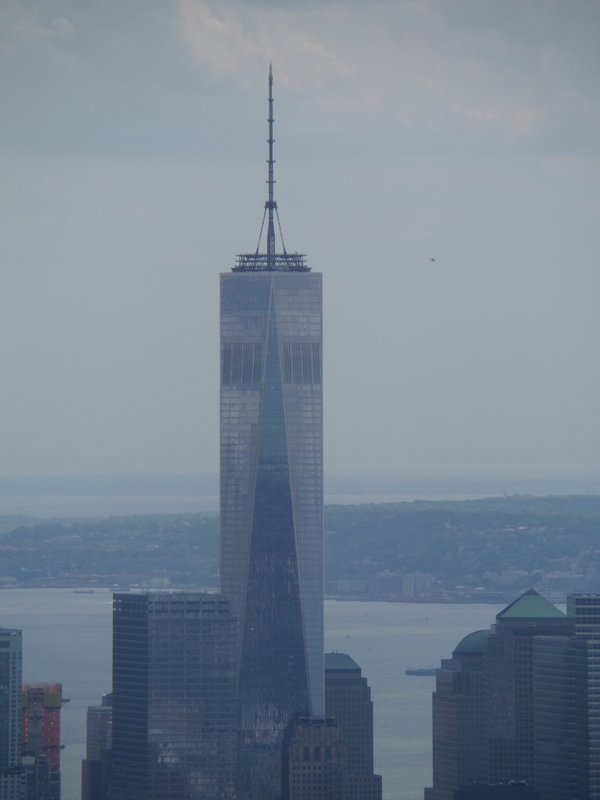 The Freedom Tower, rising high into the sky. I only wish we could have seen the Ground Zero Memorial. Next time. 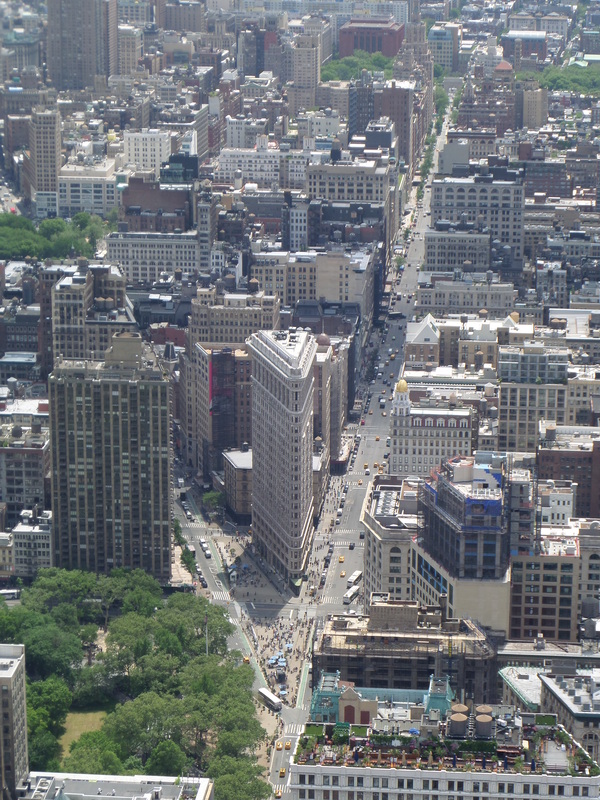 I am always mesmerized by the Flatiron Building, and it caught my eye straightaway. It was such a wonderful feeling to know that we were able to give that to Alexa, that we finally made one of her dreams come true, and she was ecstatic as we rode the elevator back down to the lobby, with a small stop at the gift shop to get some commemorative t-shirts for her and her sister. We were exhausted from the wait, but it had been well worth it, just to say that we were there, that we did it as a family. There were walls of photographs on our way out of celebrities posing at the railing or elsewhere in the famous building, but while it was great to see those familiar faces, the best ones were the smiling ones of my real family after a brilliant day in the big city. 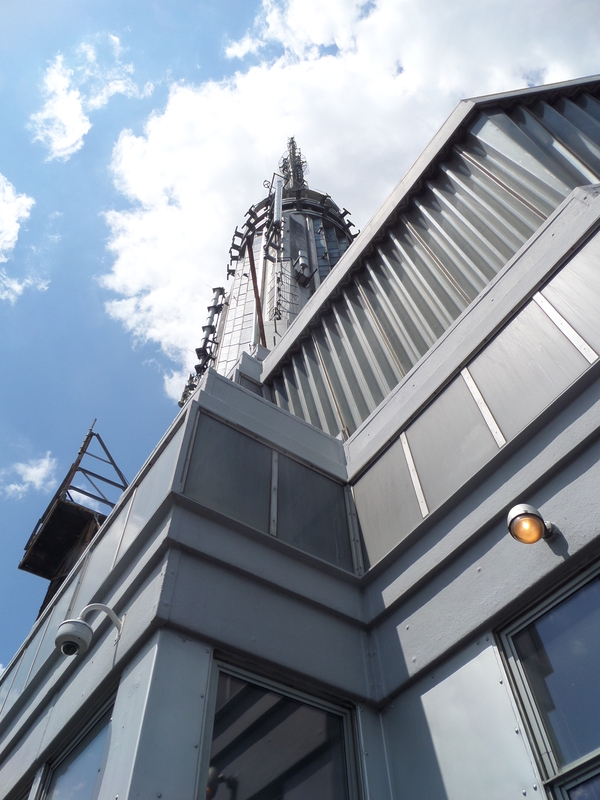 Miles of smiles from the inner sanctum on the 86th floor of the Empire State Building.